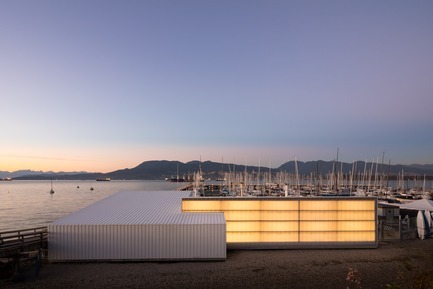 The Royal Vancouver Yacht Club’s new Dock Building is an example of industrial architectural elegance crafted from a modest budget. 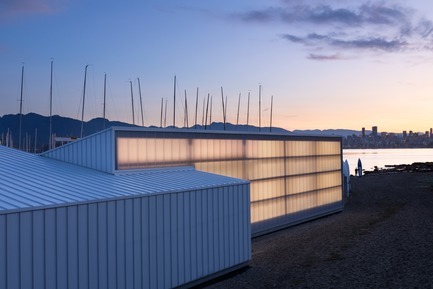 The Dock Building, located on Jericho Beach in Vancouver, BC, serves a large marina of sailboats. 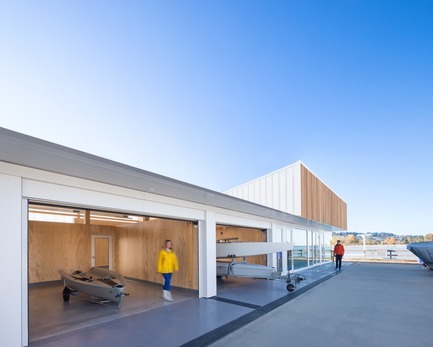 The facility provides washrooms and showers, offices for the Harbour Master, instruction space for children, and a variety of workshops to maintain boats, sails, and gear. 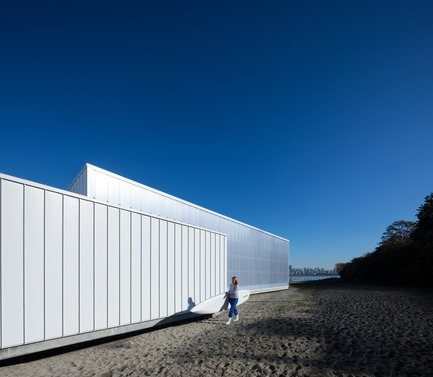 The project’s practical working needs, very modest budget, and prominent siting required a simple solution that honoured the cannery and industrial heritage of waterfront buildings that were once found on the site a half-century before. 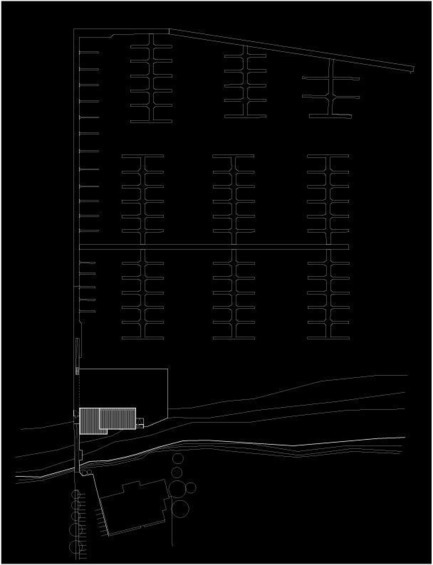 The massing is simple. 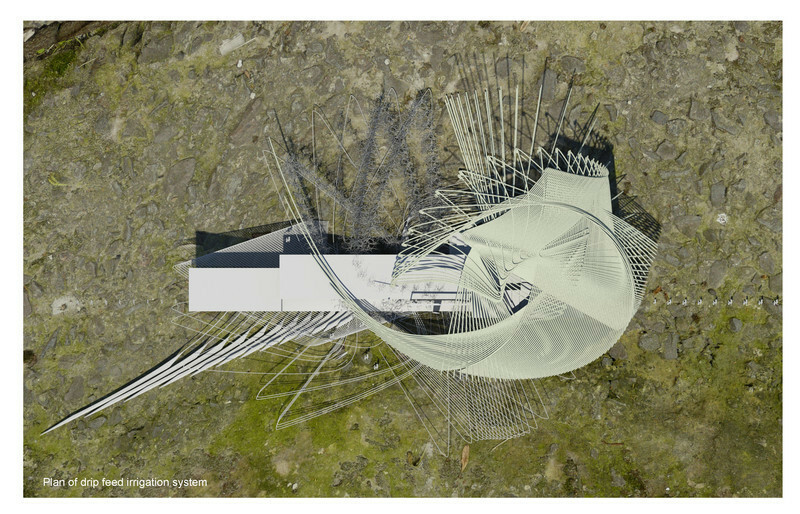 Two intersecting wedge volumes mirror each other to create a lantern to the sea and a lantern to the land. 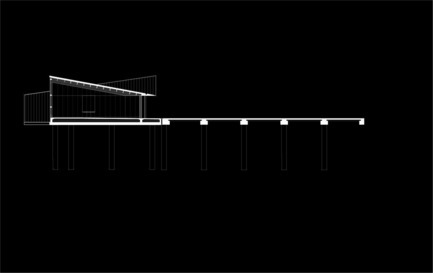 Facing land is a glulam and translucent polycarbonate wall that brings light into the workshop spaces and glows along the beach at night. 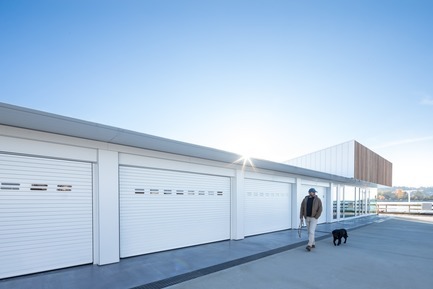 Facing the sea and the marina itself are a series of garage doors opening to the shop bays as well as glazed offices for the management of the docks. 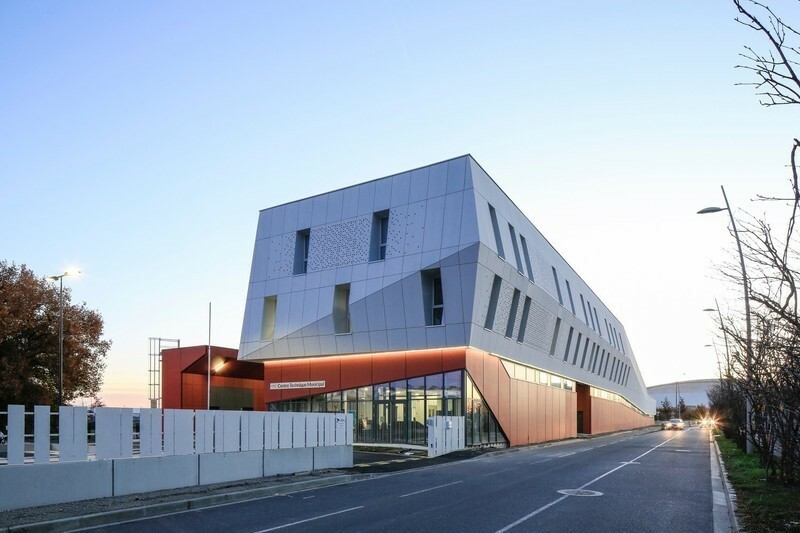 A wood screen above the offices hides the mechanical systems in the high volume of the wedge that faces the water. 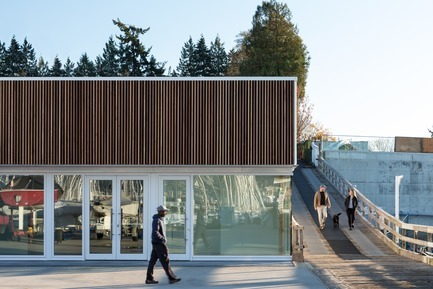 A knife-edge gutter provides an overhang for the shop doors mimicking the razor edge forms of the racing sailboats that line the dock. 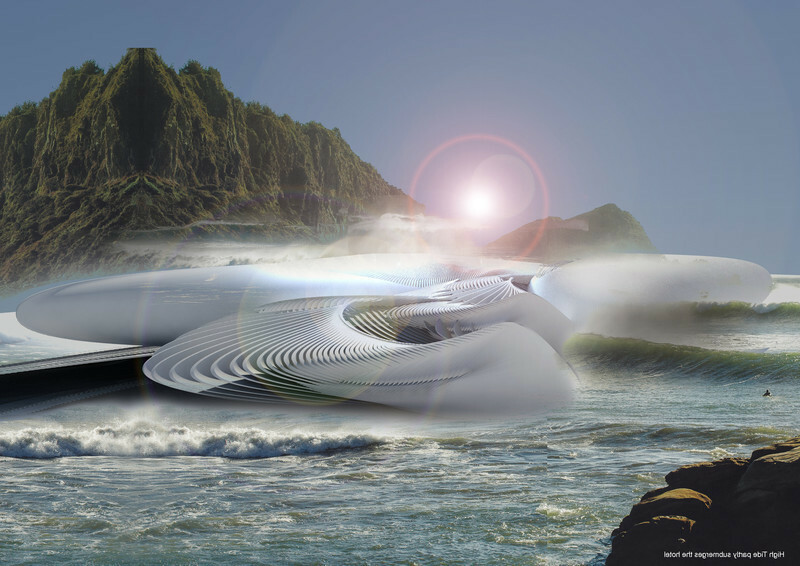 The building resides on the waters’ edge just where high tide meets the beach. 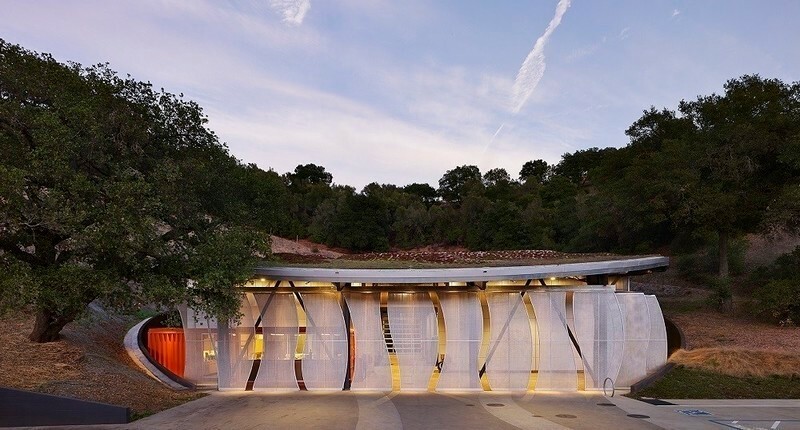 Almost half of the project budget went to the foundation and piles, leaving the design team with the challenge of meeting the project’s functional needs while delivering something more meaningful to the community. 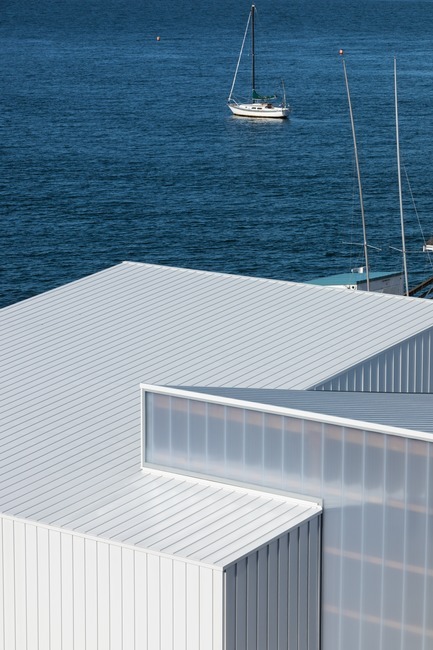 White standing seam panels are used for the exterior in the spirit of the forms and colour of the sails and boats. 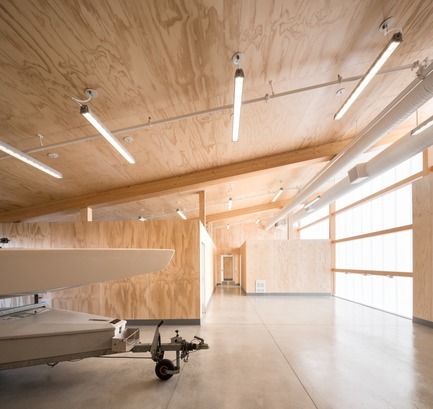 The structure is a mix of glulam posts and beams with light timber infill decking and walls. 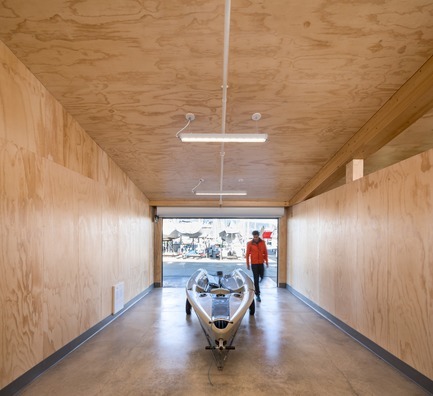 The interior is predominantly construction-grade plywood, providing a tough, easily replaceable interior finish. 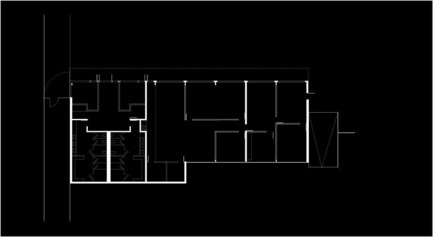 Throughout, the details are modest and practical to work with the limited project budget. 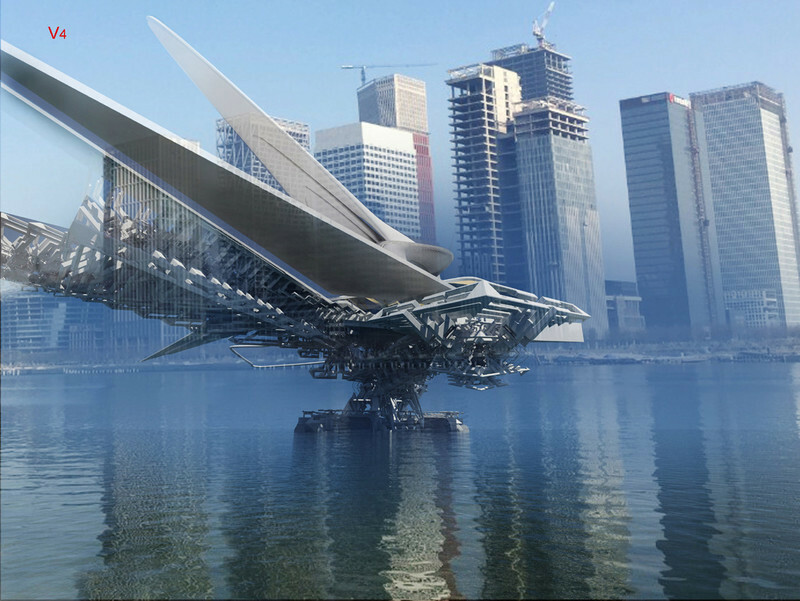 The Dock Building exemplifies what a creative team, an ambitious client, and a big vision can produce. 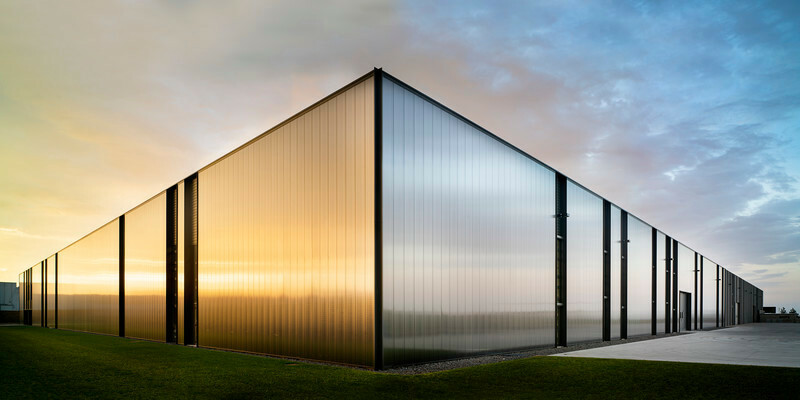 MGA is an award-winning, mid-sized architecture firm known worldwide for creating engaging, sustainable and innovative projects. 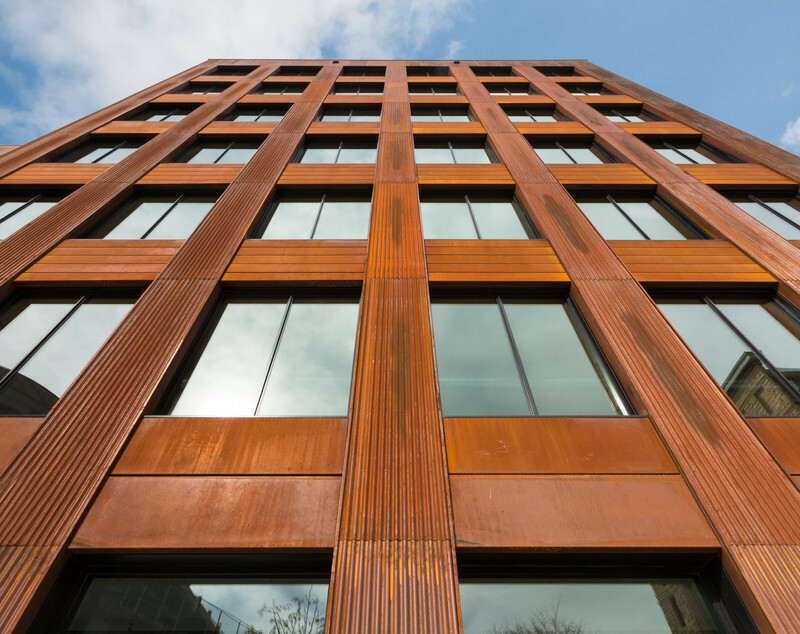 Based in Vancouver, Canada, MGA was founded by Michael Green, a leading expert in tall wood building innovation and carbon-neutral urban building approaches. 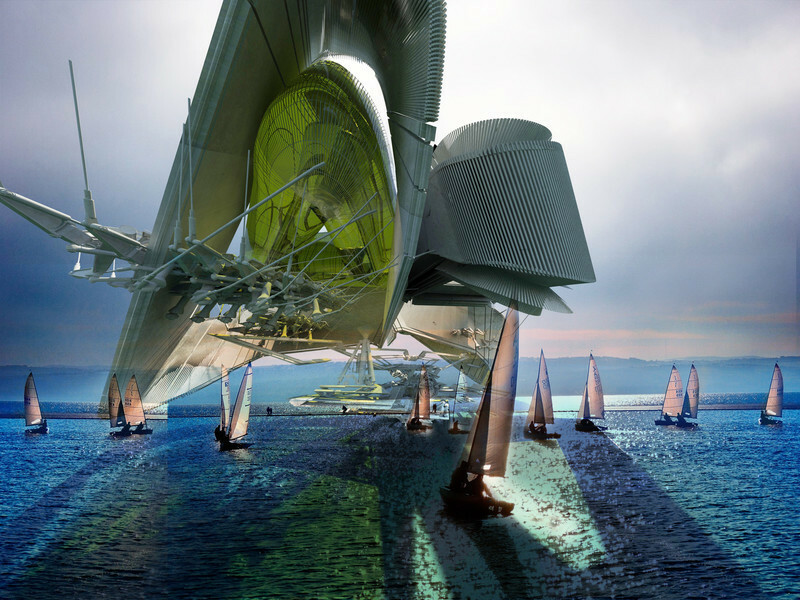 He has produced groundbreaking publications and delivered the 2013 TED talk, Why We Should Build Wooden Skyscrapers. 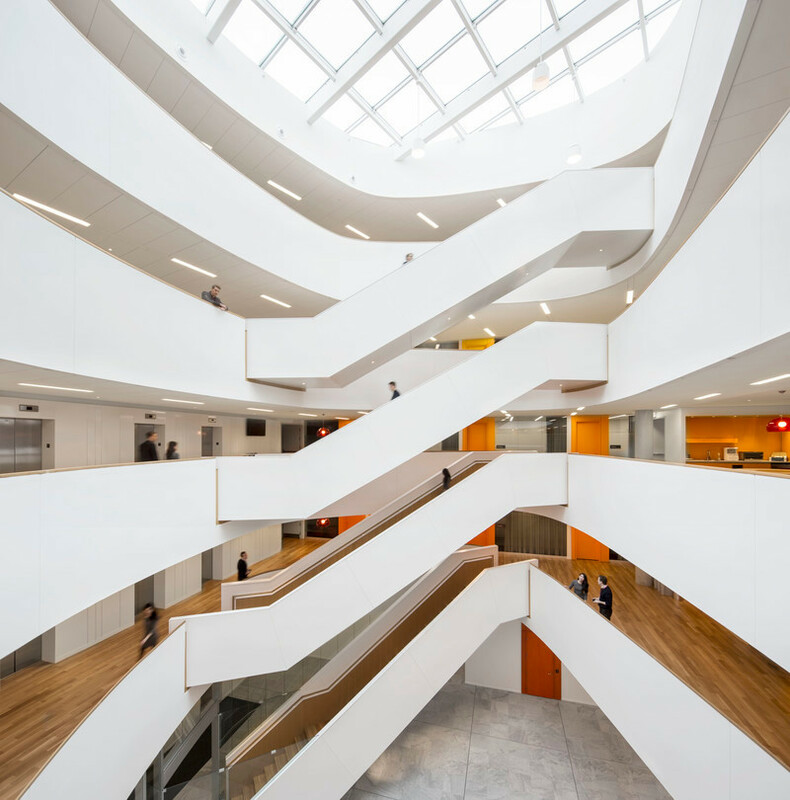 MGA has received numerous honors including three Governor General’s Medals in Architecture, the highest distinction given to architectural projects in Canada.